Bilberry Sampler and a new stitch-a-long! I started a mini sampler last month, I’d popped it in my bag when I went to Denman College just in case I had a few spare moments! I started it on the train on the way home, but until this week I hadn’t picked it up since. I bought the Bilberry Sampler last year at the Knitting and Stitching Show, it was in a bargain bucket for the grand price of £3.50, and that included all the threads!! I love the delicate colours and as there are bilberries growing on Otley Chevin it felt local! It was designed by Tina Richards Herman for Shepherds Bush. 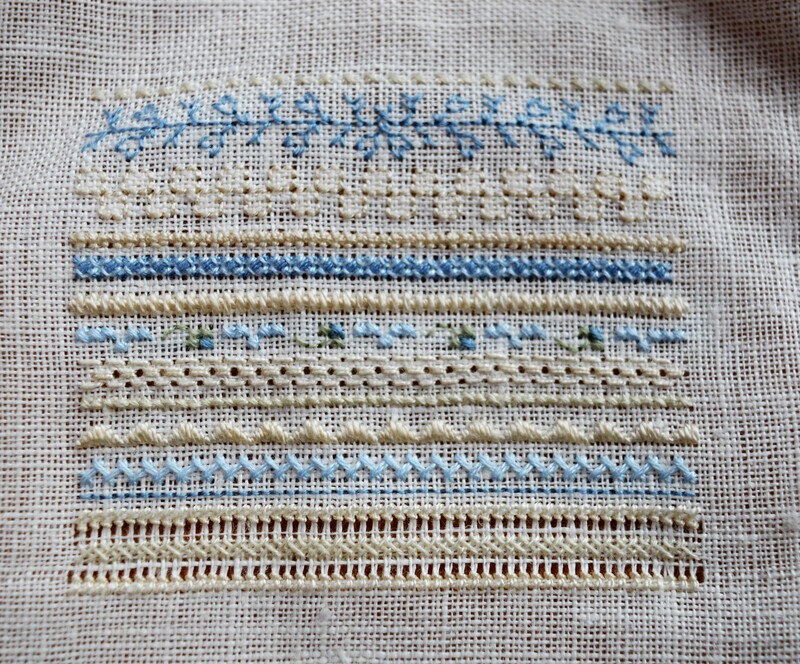 It’s a strip sampler, there’s a little cross-stitch but it is mainly what I would call hardanger embroidery, pulled thread with perle cotton, and lots of different embroidery stitches. So far I’ve stitched double back squares, Italian cross, 2-colour rice, Parisian, St Andrew-St George, cable, satin. herringbone, double herringbone and hem-stitching. So lots of new stitches to learn. It’s only three inches across so it doesn’t take long. The instructions are basic but on the whole they are sufficient, there’s a diagram of how to do each stitch. The only one I would have struggled with is hem-stitching, the instructions just say to cut two horizontal threads near the centre, unravel to edge of stitch and then reweave. I remembered how I did a sampler a couple of years ago, I cut a thread at one end of the stitching area, unthreaded it across the stitching area, I cut the thread below at the other end and unthreaded it across, so I was left with a long thread at each side. I could then remove the two short ends in the border and reweave the threads in their place. I’ve tried taking a photo but as it’s cream on cream it’s not that clear, it probably makes more sense when you look at the photo above as well for the finished effect. All that is left to do is the cross-stitch and back-stitch bilberry border at the bottom. I hoping to finish it this week as I have just signed up for a stitch-a-long with Faby Reilly and it starts next week! ‘I’ve stitched a few of Faby’s designs recently, I really like her style. Recently I made a Lavender Mother’s Day card and lavender sachets, I also made a gorgeous little humbug to hang on our Christmas tree. I recently ordered her Magnolia Sampler with the idea of somehow using it to make a stitching wallet or hussif, I’ve been mulling it over in my mind for a while, collecting ideas on pinterest when a post popped up on facebook about Faby’s stitch-a-long. I signed up immediately, it’s only £6 too. We’re making a Lizzie Stitching wallet, it sounds just like what I was wanting to make, with a needlecase, scissor holder and keeper which doubles as a mini pincushion. The colours look really pretty, I’ve ordered some permin linen in antique white and also in French Lace, which is a very pale soft green. If the French Lace doesn’t look right then I will use the antique white. My first task is to stitch the outlines. Faby has a great system for this. The pieces are all edged with a line of back-stitches which are then used to whip-stitch the wallet together. By stitching a single stitch out every 5 stitches and two stitches every ten, you are stitching a ruler as you go. For people like me who struggle with long-distance counting, it’s perfect, all these extra stitches will be on the inside once the wallet is complete. Faby has a great tutorial on this, just follow the link. The stitch-a-long starts on the 19th, so if you fancy joining in just click over to Faby Reilly Designs. She’s opened a facebook page for the stitch-a-long too so we’ll have the camaraderie as well which I find so encouraging on stitch-a-longs and quilt-a-longs. …just got to finish my Bilberry sampler first! This entry was posted in embroidery, Serendipity, Stitch-a-long and tagged embroidery, Faby Reilly Designs, Hardanger, Lizzie Stitching Wallet, Stitch-a-long. Bookmark the permalink. 5 Responses to Bilberry Sampler and a new stitch-a-long! It’s a bit like invisible zips, I always have to check some instructions! I don’t mind doing a short stretch of drawn thread, but when you see whole tablecloths…!! I think it helps if you learn young. My mom could do that stitch in her sleep, even when she had dementia in her 80’s. If she could make her fingers work, she could do it, and she probably learned when she was 6 or 7. All beautiful. Those skeins of embroidery threads come in such gorgeous colours I feel like buying some just to look at. that’s a lovely sampler, and what a bargain!